Authors are always looking for creative ways to promote their books whether they are published traditionally or independently. Yup, long gone are the days when authors were elusive superstars we admired from afar. Now both the bestselling and the fledgling author has his own website and blog, chatting with his readers and twittering about his books. As both an author and a book blogger I have seen an increase in guest blogging by authors. I have written guest posts as an author when my book Daughter of Mine, was on tour and I have hosted other author's guest posts on my review blog. 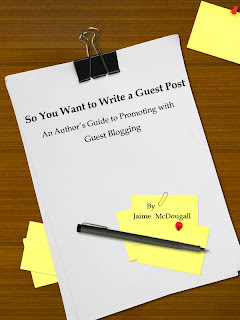 So I was curious to know what Jaime McDougall, a virtual book tour co-ordinator, would give as guidelines for guest blogging. Okay, I was more than curious; I wanted to know if I had done it right! So You Want to Write a Guest Post is an easy, quick read that will take you less than an hour to finish. It covers how long a guest post should be, how to query book bloggers, if it's okay to use the same guest post more than once and what to do after the post is live. The author also includes a Do and Don't List (which basically summarizes the book), links to some great guests posts, and a list of topic ideas for guest posts. As a blogger who has read many guest posts throughout the blogosphere and received queries, I knew much of the info in this book, but for the new author with little Internet marketing experience, this ebook provides basic info on how to promote a book successfully through guest posts. However, the info is basic, too general, and short. Smashwords states this book has about 7500 words which amounts to approximately 10 pages. With the Internet providing free and instant access to just about anything under the sun, I expected more details from this ebook, especially on how to research potential blog hosts (taking into consideration SEO and Alexa rank), how to write a post suited to the blog host, and tips on writing guest posts, including catchy titles, which can make the difference on whether a reader will actually stop to read the post. I also think that including useful links such as to blog directories, blogging tips articles, online groups, message boards, and book tour sites (which are a goldmine because of all the links to book blogs that are tour hosts) would have added more value to this book. If I could have all the info on guest blogging in one handy book, instead of being told to go look for it, I would consider it a good reference. So if you are an author with little marketing and blogging experience, then this book will give you the basics on how to guest blog properly. However, if you are a savvy researcher and a regular visitor of book blogs, you may already know to query and write a guest post, and this book would give you a few added tips, at best. A love of fiction has always coursed through her veins and she told stories as a child even before she knew how to write them. Settling into one genre was never her style and she has plans for novels in women’s fiction, urban fantasy and more – all with a touch of romance. She has been published in Chicken Soup for the Soul: High School: The Real Deal and Chicken Soup for the Soul: Campus Chronicles. She has also enjoyed writing a column called ‘The New Australian’ in local newspapers as well as various articles online. Her fiction work and poetry has been published both online and off in places including The Oddville Press (no longer running) and The Filth zine. 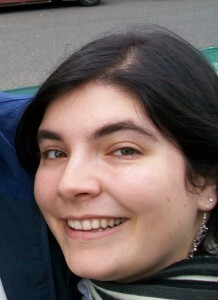 So You Want to Write a Guest Post is her first ebook and is available on Kindle and at Smashwords. Disclosure: Thanks to the author for sending me this e-book for review. I was not compensated in any other way, nor told how to rate or review this product. Ah, too bad this one was a bit disappointing (and way too short)! Interesting! I've read some great guest blogs and some not so great ones. Some guest blogs I've read have really made me want to pick the book up because they are so witty or interesting. Sounds like a great first start for any budding writer. Any advise will be well appreciated by all. Enjoyed the review and will let other friends who are "writers at heart" know about the post.